To live in an autonomous way, living systems need to obtain resources from the environment in which they live. They are simultaneously autonomic and dependent. In other words, elements in an autopoetic system are, at the same time, producer and product. I use the term “autopoesis” to illustrate that each piece is a system in itself and, in context with one another, part of a larger system. Because of the symbolic nature of the forms, they are also dependent upon a relationship with the viewer, who becomes an integral part of the production. This is my fifth and final annual show at Lanesplitter, Temescal. Please join me for a reception on July 26th from 6-9pm. If you would like to view more of my Artist Proofs or paintings, please contact me at lifelongpress@gmail.com . The initial sketch for this print, editioned at 100, was composed during an art history class in 1998. It is titled after a mixed tape made by the writer Lucas Champagne, which I listened to while composing Autopoesis 2, my second annual show of paintings at the Lanesplitter in July, 2007. This print is pulled from a 6″ x 4.25″ zinc plate, etched with traditional methods, using a hard ground, stylus, nitric acid, and drypoint. This Artist Proof is pulled from a 12.25″ x 9″ zinc plate. It is etched entirely with non-toxic methods. The line work and stippling were made using various dental tools, a stylus, and an irregular rotary tool. There is also engraving. Some foul bite is visible. This print, editioned at 100, is pulled from a 4.75″ x 6″ zinc plate, using a traditional sugar lift through a hard ground. The etching was done in copper sulfate. Some dry point is also visible. Che’s is a bar in Tucson, Arizona. I have been working on a series of 6″x6″ drawings in color pencils of the bar’s interior since February, 2009. The line work on this plate was composed freehand from memory. Che’s is a bar in Tucson, Arizona. I have been working on a series of 6″x6″ drawings in color pencils of the bar’s interior since February 2009. The line work on this plate was composed freehand from memory. This Artist Proof is pulled from a 4.5″ x 6″ zinc plate. The image was made using sugar lift and drypoint. It was etched in copper sulfate. This print, editioned at 100, is pulled from a 4.5″ x 6.25″ zinc plate. The etching was made with nitric acid using a soft ground technique, applying blades of grass and recyclable produce netting. The phrase “Run Every Sense” is from Aretha Franklin’s version of “A Change is Gonna Come.” I’ve also composed a feminist anti-war poem, “Change Is My Saving Plan,” whose lexicon is derived from Act 1, Scene i of Shakespeare’s Hamlet. This Artist Proof is pulled from a 6″ x 4.75″ zinc plate, etched with traditional methods using a hard ground, stylus, and nitric acid. 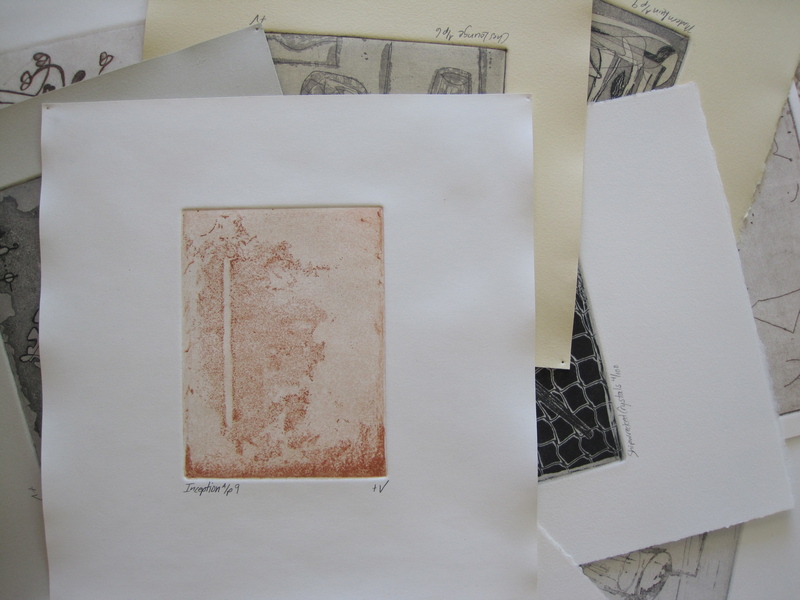 The aquatint was made with non-toxic methods and etched in copper sulfate. This Artist Proof is pulled from a 6″ x 7.25″ zinc plate. The title “Both And” is from Freud’s Interpretation of Dreams. The symbology in the bottom corner was made using a spit bite with nitric acid and first appeared in my acrylic series, “Subconscious Translation of the Binomial Theorem.” The line work was etched using a traditional hard ground, stylus, and nitric acid. The plate was also treated with a non-toxic reticulated wash and aquatint, both etched in copper sulfate. Some foul bite is also visible. This Artist Proof is pulled from a 6″ x 4.5″ copper plate. It is etched entirely with non-toxic methods, using the techniques of reticulated wash, drypoint, and stippling. Foul bite is also visible. This Artist Proof, pulled from a 4.5″ x 6.25″ zinc plate, is a result of my desire to approach a blank plate without any preconceived notion of what to do to it. Using a traditional hard ground technique, the line work was made with a stylus and various dental tools and etched in nitric acid. The gray tones are a result of a non-toxic aquatint etched in copper sulfate. This entry was posted in Encaustic, Exhibits, Ink, Intaglio, Paper, Printmaking and tagged Encaustics, exhibits, Ink, Intaglio, Paper, Printmaking. Bookmark the permalink.